For the genus of ammonite, see Hoplites (ammonite). For the river of ancient Boeotia, see Hoplites (river). Hoplites (HOP-lytes) (Ancient Greek: Ὁπλιτης) were citizen-soldiers of Ancient Greek city-states who were primarily armed with spears and shields. Hoplite soldiers utilized the phalanx formation in order to be effective in war with fewer soldiers. The formation discouraged the soldiers from acting alone, for this would compromise the formation and minimize its strengths. The hoplites were primarily represented by free citizens—propertied farmers and artisans—who were able to afford the bronze armour suit and weapons (estimated at a third to a half of its able-bodied adult male population). Hoplites were not professional soldiers and often lacked sufficient military training. However, some states did maintain a small elite professional unit, known as the epilektoi ("chosen") since they were picked from the regular citizen infantry. These existed at times in Athens, Argos, Thebes (Greece), and Syracuse, among others. Hoplite soldiers were relied on heavily and made up the bulk of ancient Greek armies of the time. In the 8th or 7th century BC, Greek armies adopted a military innovation known as the phalanx formation. The formation proved successful in defeating the Persians when employed by the Athenians at the Battle of Marathon in 490 BC during the First Greco-Persian War. The Persian archers and light troops who fought in the Battle of Marathon failed, because their bows were too weak for their arrows to penetrate the wall of Greek shields that made up the phalanx formation. The phalanx was also employed by the Greeks at the Battle of Thermopylae in 480 BC and at the Battle of Plataea in 479 BC during the Second Greco-Persian War. The fragmented political structure of Ancient Greece, with many competing city-states, increased the frequency of conflict, but at the same time limited the scale of warfare. Limited manpower did not allow most Greek city-states to form large armies which could operate for long periods because they were generally not formed from professional soldiers. Most soldiers had careers as farmers or workers and returned to these professions after the campaign. All hoplites were expected to take part in any military campaign when called for duty by leaders of the state. The Lacedaemonian citizens of Sparta were renowned for their lifelong combat training and almost mythical military prowess, while their greatest adversaries, the Athenians, were exempted from service only after the 60th year of their lives. This inevitably reduced the potential duration of campaigns and often resulted in the campaign season being restricted to one summer. Armies generally marched directly to their destination, and in some cases the battlefield was agreed to by the contestants in advance. Battles were fought on level ground, and hoplites preferred to fight with high terrain on both sides of the phalanx so the formation could not be flanked. An example of this was the Battle of Thermopylae, where the Spartans specifically chose a narrow coastal pass to make their stand against the massive Persian army. The vastly outnumbered Greeks held off the Persians for seven days. When battles occurred, they were usually set piece and intended to be decisive. The battlefield would be flat and open to facilitate phalanx warfare. These battles were usually short and required a high degree of discipline. At least in the early classical period, when cavalry was present, its role was restricted to protection of the flanks of the phalanx, pursuit of a defeated enemy, and covering a retreat if required. Light infantry and missile troops took part in the battles but their role was less important. Before the opposing phalanxes engaged, the light troops would skirmish with the enemy's light forces, and then protect the flanks and rear of the phalanx. The military structure created by the Spartans was a rectangular phalanx formation. The formation was organized from eight to ten rows deep and could cover a front of a quarter of a mile or more if sufficient hoplites were available. The two lines would close to a short distance to allow effective use of their spears, while the psiloi threw stones and javelins from behind their lines. The shields would clash and the first lines (protostates) would stab at their opponents, at the same time trying to keep in position. The ranks behind them would support them with their own spears and the mass of their shields gently pushing them, not to force them into the enemy formation but to keep them steady and in place. The soldiers in the back provided motivation to the ranks in the front being that most hoplites were close community members. At certain points, a command would be given to the phalanx or a part thereof to collectively take a certain number of steps forward (ranging from half to multiple steps). This was the famed othismos. At this point, the phalanx would put its collective weight to push back the enemy line and thus create fear and panic among its ranks. There could be multiple such instances of attempts to push, but it seems from the accounts of the ancients that these were perfectly orchestrated and attempted organized en masse. Once one of the lines broke, the troops would generally flee from the field, sometimes chased by psiloi, peltasts, or light cavalry. Probable Spartan hoplite (Vix crater, c.500 BC). By contrast with hoplites, other contemporary infantry (e.g., Persian) tended to wear relatively light armour, use wicker shields, and were armed with shorter spears, javelins, and bows. 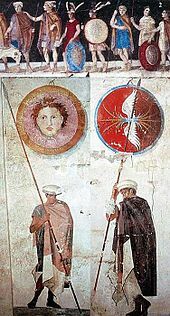 The most famous are the peltasts, light-armed troops who wore no armour and were armed with a light shield, javelins and a short sword. The Athenian general Iphicrates developed a new type of armour and arms for his mercenary army, which included light linen armour, smaller shields and longer spears, whilst arming his peltasts with larger shields, helmets and a longer spear, thus enabling them to defend themselves more easily against enemy hoplites. With this new type of army he defeated a Spartan army in 392 BC. Nevertheless, the arms and armour described above were most common for hoplites. Hoplites carried a large concave shield called an aspis (often referred to as a hoplon), measuring between 80–100 centimetres (31–39 in) in diameter and weighing between 6.5–8 kilograms (14–18 lbs). This large shield was made possible partly by its shape, which allowed it to be supported on the shoulder. The hoplon shield was put together in three layers: the center layer was made of thick wood, the outside layer facing the enemy was made of bronze, and leather made up the inside of the shield. The revolutionary part of the shield was, in fact, the grip. Known as an Argive grip, it placed the handle at the edge of the shield, and was supported by a leather fastening (for the forearm) at the centre. These two points of contact eliminated the possibility of the shield swaying to the side after being struck, and as a result soldiers rarely lost their shields. This allowed the hoplite soldier more mobility with the shield, as well as the ability to capitalize on its offensive capabilities and better support the phalanx. The large hoplon shields, designed for pushing ahead, were the most essential equipment for the hoplites. Ancient Greek marble relief c. 330 BC depicting a soldier in combat, holding his weapon above his head as he prepares to strike a fallen enemy; the relief may have been part of an official Athenian state memorial; from the Ny Carlsberg Glyptotek collection. Developed by Anthony Snodgrass, the Gradualist Theory states that the hoplite style of battle developed in a series of steps as a result of innovations in armour and weaponry. Chronologically dating the archeological findings of hoplite armour and using the findings to approximate the development of the phalanx formation, Snodgrass claims that the transition took approximately 100 years to complete from 750–650 BC. The progression of the phalanx took time because as the phalanx matured it required denser formations that made the elite warriors recruit Greek citizens. The large amounts of hoplite armour needed to then be distributed to the populations of Greek citizens only increased the time for the phalanx to be implemented. Snodgrass believes, only once the armour was in place that the phalanx formation became popular. The Rapid Adaptation model was developed by historians Paul Cartledge and Victor Hanson. The historians believe that the phalanx was created individually by military forces, but was so effective that others had to immediately adapt their way of war to combat the formation. Rapid Adoptionists propose that the double grip, hoplon shield that was required for the phalanx formation was so constricting in mobility that once it was introduced, dark age, free flowing warfare was inadequate to fight against the hoplites only escalating the speed of the transition. Quickly, the phalanx formation and hoplite armour became widely used throughout Ancient Greece. Cartledge and Hanson estimate the transition took place from 725–675 BC. Developed by Hans Van Wees, the Extended Gradualist theory is the most lengthy of the three popular transition theories. Van Wees depicts iconography found on pots of the Dark Ages believing that the foundation of the phalanx formation was birthed during this time. 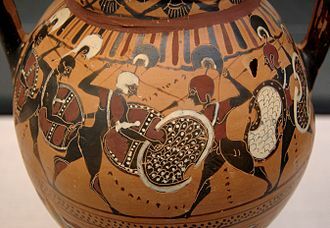 Specifically, he uses an example of the Chigi Vase to point out that hoplite soldiers were carrying normal spears as well as javelins on their backs. Matured hoplites did not carry long range weapons including javelins. 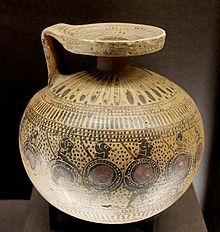 The Chigi vase is important for our knowledge of the hoplite soldier because it is one, if not the only one representation of the hoplite formation, known as the phalanx, in Greek art. This led Van Wees to believe that there was a transitional period from long range warfare of the Dark Ages to the close combat of hoplite warfare. 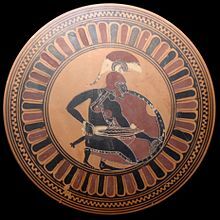 Some other evidence of a transitional period lies within the text of Spartan Poet Tyrtaios, when he wrote, "…will they draw back for the pounding [of the missiles, no,] despite the battery of great hurl-stones, the helmets shall abide the rattle [of war unbowed]". At no point in future texts does Tyrtaios involve any talk of missiles or rocks making another case for a transitional period. Extended Gradualists argue that hoplite warriors did not fight in a true phalanx until the 5th century BC. Making estimations of the speed of the transition reached as long as 300 years, from 750–450 BC. According to Nefiodkin, fighting against Greek heavy infantry during the Greco-Persian Wars inspired the Persians to introduce scythed chariots. Hoplite-style warfare was very influential and influenced several other nations in the Mediterranean. Hoplite warfare was the dominant fighting style on the Italian Peninsula up to the early 3rd century BC, employed by both the Etruscans and the Early Roman army. The Romans later changed their fighting style to a more flexible maniple organization, which was more versatile on rough terrain like that of Samnium. Roman equipment also changed, and they reequipped their soldiers with longer oval shields (scutum), swords and heavy javelins (pilum). In the end only the triarii would keep a long spear (hasta) as their main weapon. However, the triarii would still fight in a traditional phalanx formation. Though the Italian tribes, namely the socii fighting with the Romans, later adopted the new Roman fighting style, some continued to fight as hoplites. Local levied troops or mercenaries serving under Pyrrhus of Epirus or Hannibal (namely Etruscans) were equipped and fought as hoplites. Early in its history, Ancient Carthage also equipped its troops as Greek hoplites, in units such as the Sacred Band of Carthage. Many Greek hoplite mercenaries also fought in foreign armies, such as Carthage and Achaemenid Empire, where it is believed by some that they inspired the formation of the Cardaces. Some hoplites served under the Illyrian king Bardylis in the 4th century. The Illyrians were known to import many weapons and tactics from the Greeks. ^ "hoplite | Definition of hoplite in English by Oxford Dictionaries". Oxford Dictionaries | English. Retrieved 20 April 2019. ^ "Definition of Hoplite". www.merriam-webster.com. ^ Neer, Richard T. (2012). Art & Archaeology of the Greek World: A New History, C. 2500-c. 150 BCE. New York: Thames & Hudson. p. 95. ISBN 9780500288771. OCLC 745332893. ^ Gat, Azar (2006). War in Human Civilization. New York, NY: Oxford University Press. pp. 295–98. ISBN 978-0199236633. ^ Lawrence A. Tritle (23 June 2014). Phocion the Good (Routledge Revivals). Routledge. pp. 77–8. ISBN 978-1-317-75050-5. ^ Daniel J. Geagan (9 September 2011). Inscriptions: The Dedicatory Monuments. American School of Classical Studies at Athens. p. 94. ISBN 978-1-62139-001-5. ^ Cartwright, Mark (9 February 2013). "Hoplite". Ancient History Encyclopedia. Retrieved 1 December 2016. ^ Odorous Musculus, 15.44.3 "ho [men] protean apo tôn aspidôn hoplitai kaloumenoi tote [de] apo tês peltês peltastai metônomasthêsan"
^ othismos. Liddell, Henry George; Scott, Robert; A Greek–English Lexicon at the Perseus Project. ^ ripsaspis. Liddell, Henry George; Scott, Robert; A Greek–English Lexicon at the Perseus Project. ^ Kagan, Donald (2013). Men of Bronze: Hoplite Warfare in Ancient Greece. Princeton University Press. p. 10. ^ Hanson, Victor Davis (1993). Hoplites: Classical Greek Battle Experience. Routledge. p. 303. ^ Freeman, Charles (2014). Egypt, Greece, and Rome: Civilizations of the Ancient Mediterranean. Oxford University Press. p. 154. ISBN 9780199651917. ^ Zimmel, Girard, Jonathan, Todd. "Hoplites Arms and Armor". Retrieved 22 April 2013. ^ Fink, Dennis (2014). The Battle of Marathon in Scholarship: Research, Theories and Controversies Since 1850 (illustrated ed.). McFarland. p. 32. ISBN 9780786479733. ^ Sage, Michael M (1996). Warfare in Ancient Greece: A Sourcebook. London, GBR: Routledge. p. 281. ^ a b c d "Theories on Development | Hoplite Battles". sites.psu.edu. Retrieved 2016-11-30. ^ a b c "Gradualism | The Hoplite Battle Experience". sites.psu.edu. Retrieved 2016-11-30. ^ Kagan, Donald (2013). Men of Bronze: Hoplite Warfare in Ancient Greece. Princeton University Press. p. 8. ^ a b c "Rapid Adoption | The Hoplite Battle Experience". sites.psu.edu. Retrieved 2016-11-30. ^ Peter Connoly, Greece and Rome at War, p. 37. ^ Peter Krentz, Fighting by the Rules – The Invention of the Hoplite Agon. ^ Socrates as a hoplite: Plato, Symposium 219e–221b. ^ Epicurus as a hoplite: Diogenes Laërtius, Lives of Eminent Philosophers, Book X.
Cartledge, P. "Hoplites and Heroes: Sparta's Contribution to the Technique of Ancient Warfare." The Journal of Hellenic Studies vol. 97 (1977): 11–27.